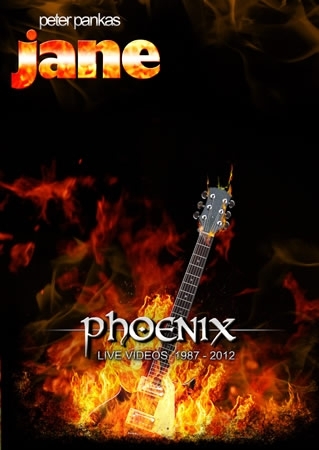 On the DVD PHOENIX is a cross section of video recordings of the past 26 years the band with a total of 4 hours of music! Among other things, there is the last concert together with Peter Panka December 2006, received at the Z7 in Pratteln / Basel. Recordings from the concert in Hamburg in 1987, and the latest footage from the last tour in autumn 2012. This production also documented clearly a balance between a glorious past and a vital presence that the band has done. Because after the tragic death of Peter Panka 2007, the founder and head of the band, Klaus Walz and Charly Maucher are subject to the obligation of drummer Fritz Randow (ex-Eloy, Epitaph, Saxon), guitarist Niklas Turmann (Uli Jon Roth, Crystal Breed ) and keyboardist Corvin Bahn (Crystal Breed, Gamma Ray, Uli Jon Roth) today a real all-star cast available. In the seventies Jane mobilized not only in this country but also in Austria and Switzerland, many Fans and were among the top earners of the German rock music. In the recent times, especially since 2006, Peter Pankas Jane experienced a remarkable renaissance, which is reflected in many sold-out concerts. This Product was added to our catalogue on Friday 24 May, 2013.